JOHANNESBURG, SOUTH AFRICA and LONDON, UNITED KINGDOM--(Marketwired - Dec 9, 2015) - JLL (NYSE: JLL) today announced the acquisition of Trussard Property Consultants, a leading local real estate leasing and investment agency business, based in Johannesburg. The addition of Trussard will further accelerate the strong growth momentum in JLL's South Africa business which is based in Rosebank, Johannesburg. Vincent Lottefier, JLL's EMEA Management Board sponsor for Africa, said: "This is an exciting and complementary fit between two companies that know each other very well. We have similar cultures, both with a very strong focus on service excellence and integrity, and on the broader strategic needs of our clients. It is also an important further step in JLL's broader Africa growth strategy, which has also seen us open new offices in Lagos, Nigeria and Nairobi, Kenya within the past 15 months." Craig Hean, Managing Director, JLL South Africa, said: "We have enjoyed strong growth in our business recently and we have also observed the way this whole market is growing and changing in South Africa. We wanted to do something transformational here in Johannesburg and combining with Trussard was always our Plan A to achieving that goal. We are delighted with this outcome and looking forward to using this as the springboard for further success in 2016." Edward Ward, Partner, Trussard Property Consultants, said: "This acquisition is the right logical strategic growth step for Trussard. The synergies in terms of our local knowledge and JLL's international platform enable us to provide our clients with a broader range of property specific services. JLL has a great reputation and are the right partners for us going forward in this changing commercial and industrial property services market." Trussard was founded in 2006 by Edward Ward and Mark Truscott, with Dennis Helyar joining in 2008 as a third partner. 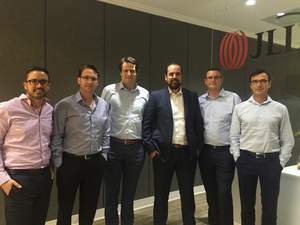 The acquisition takes immediate effect with Trussard Property Consultants to be fully rebranded as JLL by mid-2016, with the combined business operating from both the existing JLL and Trussard Johannesburg offices. Overall, JLL South Africa now employs more than 60 people. Trussard was founded in 2006 by Edward Ward and Mark Truscott, with Dennis Helyar joining in 2008 as a third partner. Trussard was founded on the basis of offering clients honest and market relevant advice. Trussard has always focused on understanding their clients' requirements and applying this to a property context. Applying these principles has enabled Trussard over the past 10 years to assist in excess of 640 commercial and industrial property clients ranging from SMEs, national and multinational companies. The benchmark for this success can be measured in terms of the same clients that have been assisted numerous times over the past 10 years.